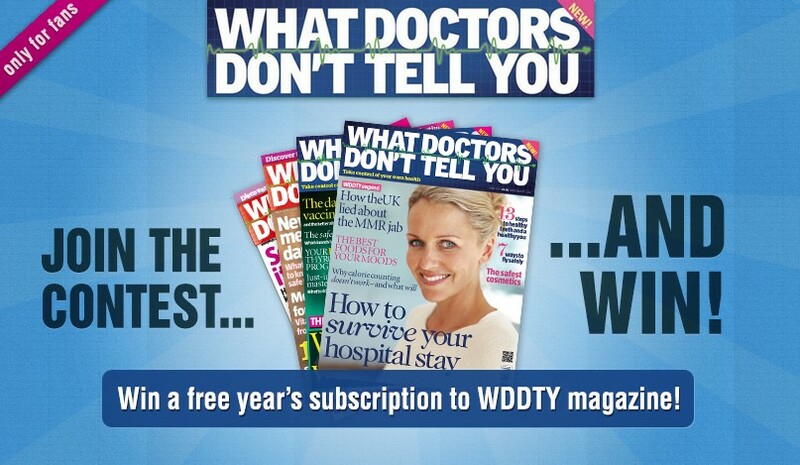 Do you want to win one of our 5 one-year subscriptions to WDDTY magazine? After answering, you will need to get the maximum amount of votes from your Facebook friends and WDDTY Facebook fans. The participants whose slogans attract the five highest number of ‘likes’ or votes will win a year’s subscription to the magazine. That means the next 12 issues will be delivered to your home -- wherever you are in the world -- free of charge. Let your creativity take flight -- and you could start having WDDTY delivered to your home for a year for free! WDDTY, What Doctors Don't Tell You (a trading name of Wddty Publishing Ltd.) company registration No. 06400691, Registered in England and Wales and with the Registered office: Unit 10, Woodman Works, 204 Durnsford Road, London, SW19 8DR, is organising the competition "Win one of our five one-year’s Subscription to WDDTY Magazine" (hereinafter, the "Competition"), which will be carried out according to the rules set out in these terms and conditions. Increase traffic and sales of WDDTY products through the web page www.wddty.com and the magazine’s Facebook page. 3.1. The Competition is open to persons of legal age anywhere in the world. Five one-year’s subscriptions to WDDTY magazine, with a value of up to £60, depending on territory. 4.2 The prize is not subject to change, alteration, compensation or transfer to third parties. The prize is personal and non-transferable. 4.3 However, WDDTY reserves the right to make, at any stage, changes that lead to the successful execution of the Competition, including but not limited to, the extension of the Competition period, the contribution of new prizes, the modification of the terms and conditions of participation, in short, all those changes that under WDDTY discretion involve an improvement in achievement of the Competition's purpose. Such modifications shall be communicated through www.facebook.com/WDDTY. 4.4 In no case whatsoever shall the prize be exchanged for cash. 5.1 The following may participate in the Competition: (i) persons resident anywhere in the world, who are (ii) over 18 years of age (iii) and who comply with the rules of the Competition as set out in section 6 of these terms and conditions. 6.1 Those individuals wishing to participate in the Competition must answer the question presented in the Contest within the period established in these terms and conditions. 6.2 Internet users shall be responsible for choosing the winning answers through their votes (votes for yourself won't count). 6.3 WDDTY reserves the right to declare the prizes as void/not awarded. 2.Where the answers may be considered in bad taste or offensive, as determined by WDDTY and its officers. 3.Where the answers or their participants do not comply with, in some way, the conditions established in these terms and conditions. 8.2 Communication of the winners: the winners will be contacted via email and http://www.facebook.com/WDDTY by April 15th, 2013. 9.1 All participants accept and exclusively assign to WDDTY and any of the companies of the Wddty Publishing Ltd. Group, the entirety of the intellectual property rights inherent in the “slogans” or “sayings” entered,,with worldwide territorial scope and for the legal duration of the assigned rights, so that WDDTY, or any of the companies of the Wddty Publishing Ltd. Group can publically use, put in place, reproduce, distribute or communicate the phrases for their use in any medium or form, without any right to receive compensation for the assignment. 9.2 Participants guarantee that they are the individual authors of the “slogans”, that the “slogans” are original and do not infringe any third party’s copyright. 9.3 The winning participants give their express permission to use their “slogan” and full name, and release the personal content rights to WDDTY or any of the companies of the Wddty Publishing Ltd. Group for advertising, commercial, promotional or similar such purposes for the answers submitted for the Competition.. Similarly, the “slogan” is extended to include its use on the Internet and any digital format. All the above is in accordance with UK law. 10.1 In compliance with UK Data Protection Law Act 1998 by means of which the Implementing Regulation of the aforementioned Law was approved. The winners of the Competition authorise the inclusion of their personal data in a file held by WDDTY which shall be treated confidentially for advertising, promotional and information purposes for the products, services and activities of WDDTY. Similarly, the winners authorise WDDTY to share their “slogan” and data on social networks hosted on the Internet, as well as for advertising and promotional purposes, within the framework of campaigns to develop the WDDTY brand image that Wddty Publishing Ltd. may carry out. The winners can exercise their right to access, rectify or cancel the data by sending a letter to Unit 10, Woodman Works, 204 Durnsford Road, London, SW19 8DR telephone number +01371 851883 or by email to beata@wddty.co.uk. Unless otherwise stated within a period of thirty days, it shall be understood that the winners give their consent to the processing of their details, which, in any case, can be revoked at any stage Similarly, the winners authorise the assignment of their data to any of the companies of the Wddty Publishing Ltd. for the same purpose. 11.1 Participation in the Competition implies participants' full acceptance of these terms and conditions and their agreement to submit to these terms and conditions.